For those who are just plain tired of jotting! 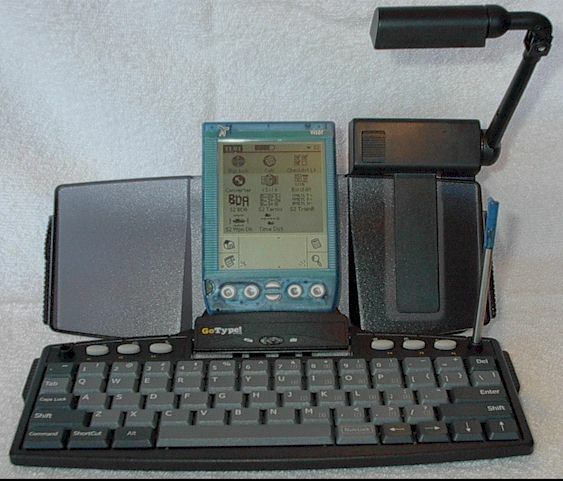 PDAs don't have keyboards... you have to enter information by "Jotting" it onto a special part of the screen or by poking at a small on-screen keyboard. The good part is that it keeps the size small. The bad part is that jotting requires that you learn to write letters a certain way, and it is SLOW. Most of the time this is acceptable because you only input a few items while away from your PC. But when you need to input a LOT of information away from your PC - like at a meeting or briefing - jotting becomes painful! You CAN buy a laptop (obsolete ones start at about $500), or you can equip you PDA with an external keyboard. I've seen several keyboards for sale for Palm Devices. 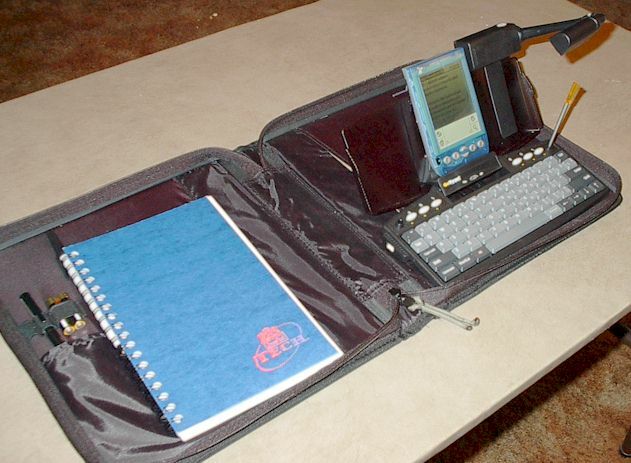 The Targus Stowaway Portable Keyboard IS full size, and folds up into a small package not much bigger than your PDA. The downside is that is costs $99 and didn't feel too sturdy when unfolded: OK for the staff meeting table-top, but maybe not OK in your lap in the back of a Hummer. 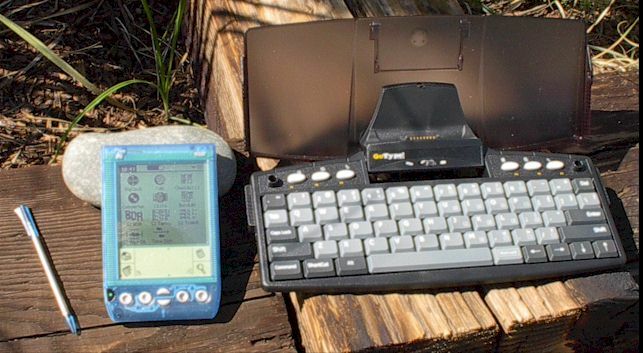 Several models (Kensington PocketType, Seiko ThumBoard, DS Int'l Pocket PDA Keyboard) ARE the size of your PDA and cost about $45, but they may be a bit small for your fingers. The GoType sits in the middle. It costs $70, and is about 80% the size of your keyboard. Folded up, the keyboard is 10" wide, 4.5" deep, and 2" thick at the back. The keyboard does not require batteries. 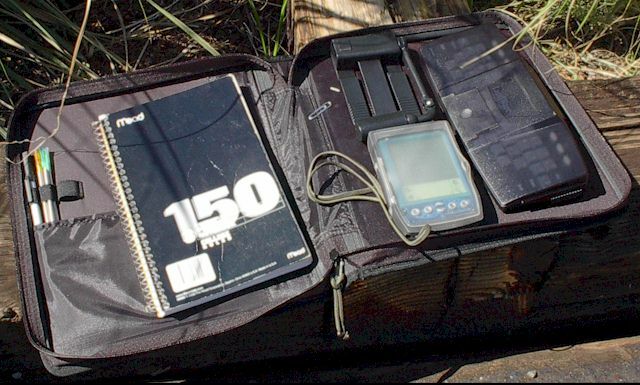 Note how it fits easily into a normal 3-ring zippered binder along with the PDA, book light, and small notebook. Also note that the 3-ring part has been removed! Hey, who needs it? The lid folds up and the PDA rests on electrical contacts that look like those on its sync cradle. 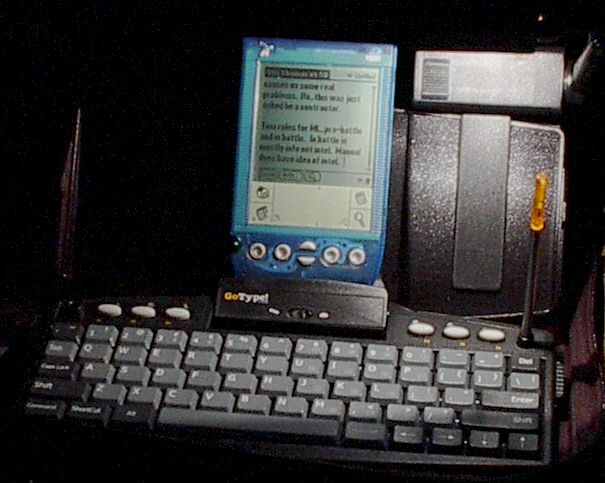 In fact, the keyboard comes with a cable that can connect the keyboard to your PC, allowing you to sync the PDA right on the keyboard. A 3" stabalizer pulls out the back to keep the weight of the PDA from toppling the keyboard over backwards. Note the two holes for parking your stylus. The gadget to the left is a Tensor brand book light I picked up at Staples for $5. Tensor has a web site, but doesn't sell their book light on it. However, just about ANY small book light will do. 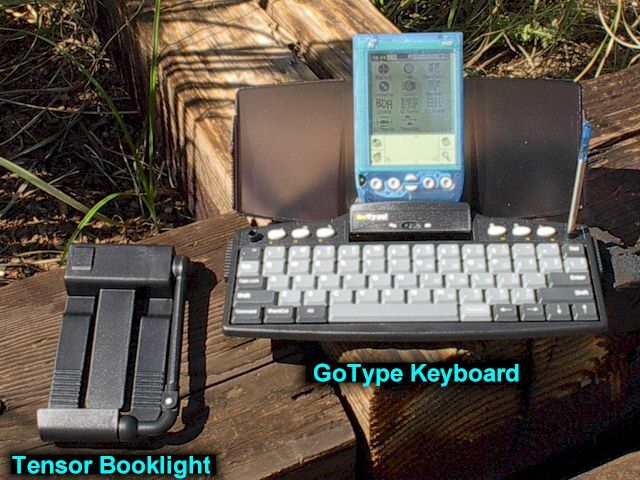 The book light clips to the keyboard cover and provides enough light to see the screen and type. The picture to the right was taken without flash. That top picture with the parts just laying in my notebook nearly cost me the key board! As soon as I unzipped the notebook to lay out the gadgets, out slid the keyboard onto the log. Ouch - good thing it's durable!! To prevent that from happening again, I secured all the pieces to the inside of the notebook. The challenge is to do it in such a way that you can easily remove them and use them elsewhere. So my first Course Of Action involving two tubes of Super Glue was discarded. Course Of Action 2 required sticking Velcro strips on everything. However, Velcro on the bottom of the keyboard would cause it to tilt & wobble if I ever sat it on a flat table. Course Of Action 3 involved a strip of non-stick Velcro that has hooks on one side and loops on the other: available in sporting good and hardware stores. I first slid a cardboard stiffener into the nylon flap of the notebook; the back of a legal pad works just fine! I cut two slits through the nylon and the cardboard and slid the Velcro through these and around the extended stabilizer on the keyboard. The keyboard lid can freely open, but the keyboard itself is safe from falling out and damaging my landscaping timbers! The PDA is mounted by sliding it's plastic cover through two slits in the nylon. 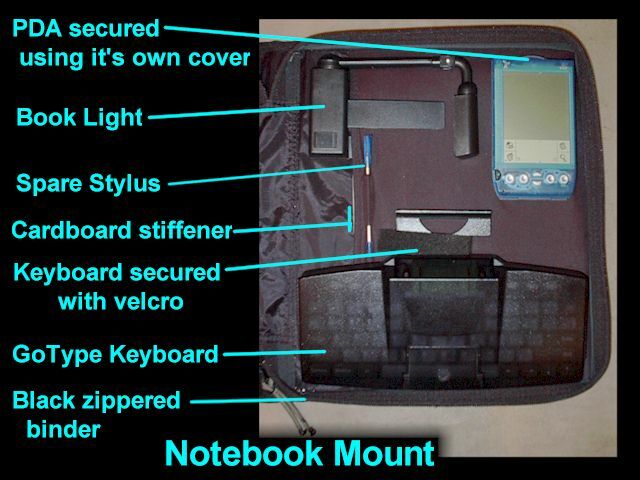 This technique is explained in detail under Notebook Mount on the "Protect Your PDA" page. The book light simply clips to the cardboard insert, and I cut a couple small slits to hold an extra stylus. Once completed, I subjected this setup to the Standard S2 Company Field Test: I sat on my swing under the blue Arizona sky and - beverage at hand - set the rig in my lap and typed stuff for a half hour. It worked! The S2 Company is not affiliated with Landware, Inc, in any way except that we bought their keyboard and love it!